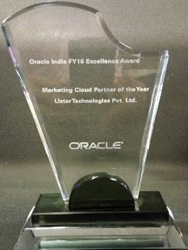 Lister Digital (http://www.listerdigital.com), CX Solution Experts, has been recognized as Oracle India’s 2016 Marketing Cloud Partner of the Year for demonstrating business excellence and customer satisfaction in delivering innovative solutions with the Oracle Marketing Cloud. The award recognizes Lister Digital’s deep industry and technology expertise, and the company’s ability to help customers realize results with digital, cloud-based solutions. Lister Digital’s solutions combine thought leadership talent, efficient delivery staff and its own technologies with the purpose to solve the complexity and fragmentation issues that exist in cloud offerings today. The company offers solutions that accelerate and heighten any organization’s investment in the Oracle Marketing Cloud, and specifically the Responsys, Eloqua, Maxymiser and BlueKai platforms. Lister Digital (http://www.listerdigital.com) is a CX Consulting and Solutions provider with Digital Marketing, e-Commerce and CRM practice areas. The company is uniquely positioned to help organizations cut through the clutter of marketing noise and tools and connect the dots between Strategy, Technology and Execution in an intelligent, practical and hands on manner.